The first post from an article originally published in Grafik Issue 193, an explanation of the thinking behind Alias Ano typeface and its use in Another Man magazine. Another Man is published by Dazed Group, publishers of Dazed & Confused and Another magazine. It was launched as a bi-annual mens fashion magazine to sit alongside Another, which had carved a niche as an intelligent and dynamic force in fashion publishing. Another had an eclectic range of editorial content alongside innovative and exciting fashion photography, then aimed at both men and women, at this time designed and art directed by New York-based design agency Buero. Another Man wanted a strong and separately defined vision in its editorial content, art direction and design. Stunning and progressive fashion and portrait photography with a mix of political and new and archival cultural editorial – fashion, art, architecture, film, design. The design of a typeface for use for all aspects of the magazine’s editorial defined the design direction of the magazine. The starting point for this typeface came from some reference material, with a row of sans serif lower case letters a – e, at two sizes but with the same line weight. A very simple but striking idea. A simple geometric, monoline framework allowed for a stylistic consistency over three variations. Regular – a ‘standard’ alphabet; Upper Lower – where upper case characters are replaced with oversized lower case; Wide – where upper case characters are the width of a square, and lower case the same style half the width of a square. Each style drawn in italic and back-italic versions. The resulting nine variations in six weights made 54 fonts in total. For weights Regular through to Eighth the character weights divide in half. So the Half weight is half that of Regular, Quarter weight is quarter that of Regular and so on. This means for example that when Ano Half is set at twice the size of Ano Regular the weight of line is the same between the different character sizes. This proportion was used whenever typefaces were used in combination, so that headline and standfirst typography always had a consistent weight of line. 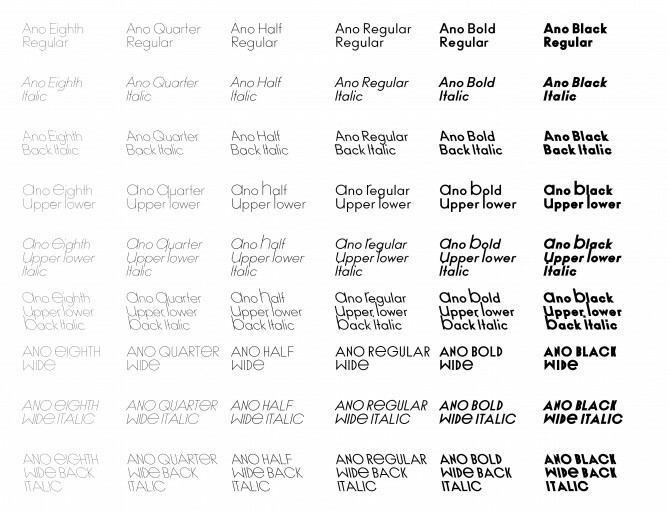 The different styles and mathamatically defined weights allowed for a variety of layout options. For example by using different sizes and mixing up upper and lower case letters in Upper Lower, and by stacking letters into block shaped words in Wide. The two bolder weights were drawn without this mathametical weight increase, as doubling the Regular weight would have filled in its counters and look clumsy. These Bold and Black weights allowed for a different and separate set of ideas for headline and impact typography and was a good balance against the stick-like constructions of the lighter weights.